Free moisture forms a film around each particle. This film of moisture exerts what is known as surface tension which keeps the neighbouring particles away from it. Similarly, the force exerted by surface tension keeps every particle away from each other. Therefore, no point contact is possible between the particles. This cause bulking of the volume. The extent of surface tension and consequently how far the adjacent particles are kept away will depend upon the percentage of moisture content and the particle size of the fine aggregate. 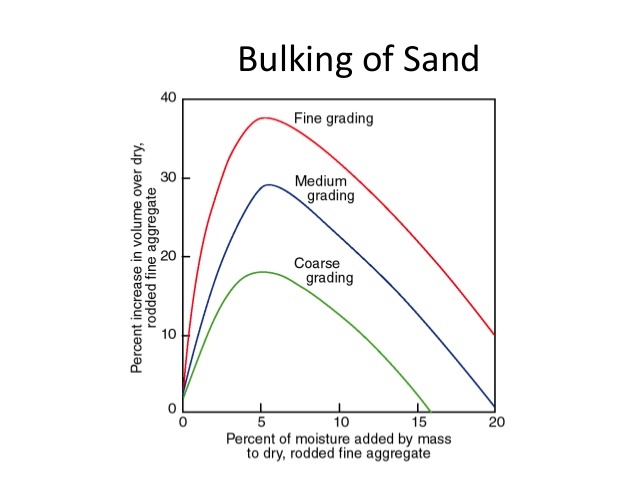 It is interesting to note that the bulking increases with the increase in moisture content upto a certain limit and beyond that the further increases in the moisture content results in the decrease in the volume and at a moisture content representing saturation point, the fine aggregates shows no bulking. It can be seen from the figure below, that fine sand bulks more and coarse sand bulks less. From these it follows that the coarse aggregate also bulks but the bulking is so little that it is always neglected. Extremely fine sand and particularly the manufactured fine aggregate bulks as much as about 40 %. Due to the bulking, fine aggregate shows completely unrealistic volume. Therefore, it is absolutely necessary that consideration must be given to the effect of bulking in proportioning the concrete by volume. If cognisance is not given to the effect of bulking, in case of volume batching, the resulting concrete is likely to be undersanded and harsh. It will also affect the yield of concrete for a given cement content. The extent of bulking can be estimated by a simple field test. A sample of moist fine aggregate is filled into a measuring cylinder in the normal manner. Note down the level, say H1. Pour water into the measuring cylinder and completely inundate the sand and shake it. Since the volume of the saturated sand is the same as that of the dry sand, the inundated sand completely offsets the bulking effect. Note down the level of the sand say, H2. Then H1 - H2 shows the bulking of the sample of sand under test. In a similar way the bulking factor can be found out by filling the wet sand in a water tight measuring box (farma) up to the top and then pour water to inundate the sand. Then measure the subsidence of sand and express it as a percentage. This gives a more realistic picture of the bulking factor. The field test to find out the percentage of bulking is so simple that this would be conducted in a very short time interval and the percentage of bulking so found out could be employed for correcting the volume of fine aggregate to be used. This can be considered as one of the important methods of field control to produce quality concrete. Since volume batching is not adopted for controlled concrete, the determination of the percentage of moisture content is not normally required. The quantity of water could be controlled by visual examination of the mix and by experience. The percentage of free moisture content is required to be determined and correction made only when weigh batching is adopted for production of quality concrete. thanks for sharing this valuable post. there are lots of related recruitments and i will definately try my luck. :) now, time to share it with others. thanks again. Hiii Mukesh sir... how r u.. I am a biggest fan of u and i watch ur BBS vedios that all are awesome and thankyu for that.